We are kind of a little obsessed with our granola bars. They are just so yummy! I make a batch every 2 weeks or so since Hubby takes one in his lunch every day. 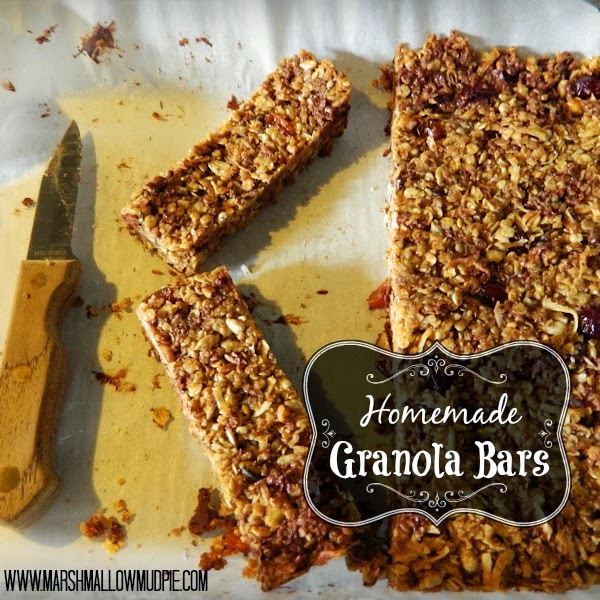 Hubby doesn't like the hard, crunchy kind of granola bars, so this recipe is for the chewy kind. Parchment Paper *Don't use wax paper as pictured!!! You will have to throw out your whole batch! Mix the oats, nuts, shredded coconut, wheat germ, and ground flaxseed. Add butter, honey, vanilla, brown sugar, and salt to a small sauce pan on medium heat. Stir frequently. Again, really try to get raw, local honey. It's amazing for you. I missed the farmer's market this week so I just used Publix honey since it says it's from Florida. When it starts to froth up (as pictured below), it's done. Pour immediately into your bowl of dry ingredients and mix. Stir in chocolate chips and berries. Spoon mixture into 9x 13 glass baking dish lined with parchment paper. I made the mistake of picking up wax paper instead of parchment paper, and the granola bars stuck to the paper. I ended up having to peel off what wasn't stuck and had a big crumbled mess. I did end up using the crumbled mess as granola cereal though, so it wasn't a total loss. I usually tear an extra piece of parchment paper to use to spread the mixture flat in the dish. It works much better than just trying to use a spoon. *Oh, and your chocolate chips will melt, which is fine by me because I just use them to give the bars a chocolatey taste. Bake in oven at 350 for 25-30 min. When done, remove from oven and let sit for 2 hours. When the 2 hours are up, get a tough knife and cut into bars. Really, a flimsy knife will not do the job. I package them individually into snack size zip bags. They're great for lunches, or snacks on the go. Super hearty and filling, and the best part to me is that I know what's in them (unlike the store bought kind)!! If you try them, let me know how you like them or if you modified the recipe! I don't like coconut, is there something I could substitute or could I just leave it out? I've never tried, but I'd imagine you could just sub in an extra cup of oats. Or, an extra 1/2 cup of oats and and extra 1/2 cup nuts. So i substituted wheat germ with more oats, put dried bananas in with the nuts, and used coconut oil instead of butter. I also used organic maple syrup rather than brown sugar. I then put dried pineapple in & sprinkled chocolate chips on the top. I modified the recipe quite a bit. Mainly because we don't use white or brown sugar. So I decided to try to turn them into some sort of peanut butter granola bars. I used 4 cups of oats, no nuts, chocolate, or shredded coconut. I used 1/4 cup pure maple syrup, and 1/2 cup natural peanut butter and no brown sugar. I heated the maple syrup and pb with the butter, salt and vanilla. Once combined I poured that on the oats, flax seed, wheat germ, and oh I added 1/4 chia seeds. I mixed that and then added in my 2/3 cup raw honey. Wow, sounds really good - and good for you!